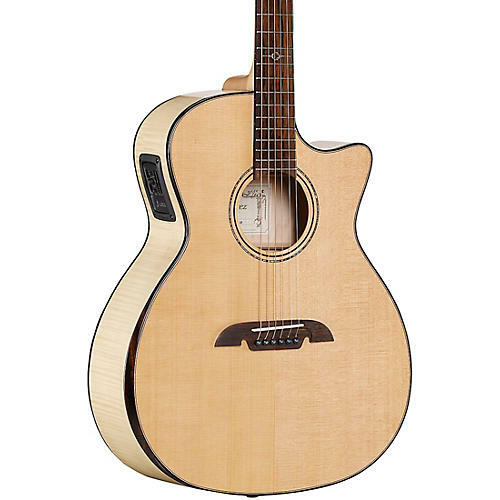 The AGFM80CEAR Artist Elite acoustic-electric guitar is a beautifully developed Grand Auditorium that delivers in terms of both of tone and looks. The minimal styling of this guitar really creates a classy vibe with the light blonde of the spruce and maple framed with ebony. Tonally, this guitar has a robust voice, with shimmering trebles, plenty of low end and an instant response. It also offers added functionality and comfort with its cutaway and slim-style bevel armrest, making the AGW77CEARSHB Artist Elite acoustic-electric guitar a not just a great looking instrument, but a versatile one as well. There are many wonderful guitars available, and some are every inch as beautiful as Artist Elite, but this stunning line of guitars is the culmination of years of R&D that allows Alvarez to produce custom-style instruments crafted from amazing tonewoods with a truly radiant vibe. Artist Elite guitars look amazing, sound rich and offer a level of fit and finish rarely attainable at such price points. The term “solid top” refers to the soundboard of an acoustic guitar being made of solid wood, rather than being laminated. However, just because the top is solid, it does not necessarily mean the sound automatically benefits from this feature. The tone of the instrument only improves significantly when the whole guitar is built correctly to optimize the energy a solid soundboard can generate. Artist Series Elite guitars are built to do exactly this. Each model is designed to get the best out of its components, and for them to work together to produce balance, lively projection and great response. These components include bracing architecture that is specifically designed for each body shape or tonal requirement. Alvarez's bi-level bridge is designed to heighten string tension and improve sustain and response. Real bone nut and saddle, premium tonewoods and Alvarez's crafted attenuated finishes all further the quality of construction and positively impact the performance of the instrument.